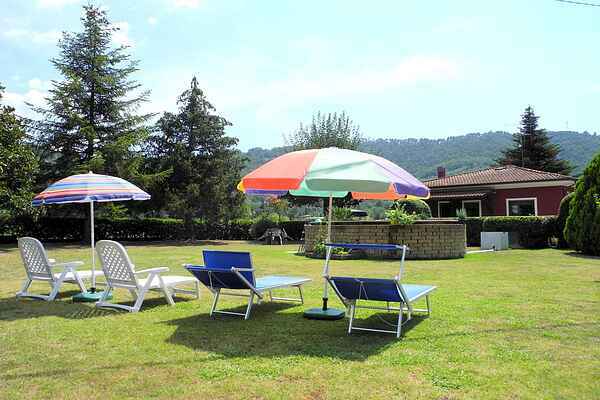 Lovely holiday home, situated in a green area north of Camaiore and not far from the sea. The house is comfortably furnished in typical rustic style with some classic shades, but with modern facilities and equipment. Entrance terrace (tiled), beautiful green garden around the house, hedge, large lawn for exclusive use, plants and fruit trees, garden furniture. Above ground swimming pool. Beautiful views of hills and mountains. The house offers lots of privacy and tranquillity, but it is not far from shops and restaurants (in Camaiore) In 20 minutes by car you can easily reach Lucca and the beaches of Versilia (Viareggio, Lido di Camaiore). This type of accommodation is particularly suitable for those who love to walk or bike. From that position it spread many small roads and paths that connect a bit 'all over the hill of Camaiore especially the part towards the mountains. At 500 meters from the house we have the old town full of churches and history attreversato from the famous Via Francigena, the road of the pilgrims on the road to Assisi used to stand in these places. There are many small towns and villages to explore, with wonderful views each with its own traditions and its customs which, although only a few meters from each other seem to form part of worlds so far apart. For those who understand the language of love to listen to stories can engage in conversation with the locals always very helpful and friendly. For those more intrepid or in good physical shape can not miss the path along the river that leads straight to the sea. A path from the path a bit 'cramped but totally devoid of danger, and quite charming. During the summer and into the autumn, the town comes alive in the historic center with its various fairs and markets, each with a different theme and very deep roots. Among the most noteworthy features include the ultra centeneria recurrence of sawdust carpets that takes place ognio year in the first fortnight of June, as well as the trade of All Saints on 1 and 2 November. Another important event is the one with the Humor of August, the week of the antiques market by colorful performances and dances that spread to every corner of the district and the city center.